Autism is a pervasive developmental disorder characterized by difficulties in social skills, communication, and behavior. Five disorders fall under the umbrella of Autism Spectrum Disorders: autism, Asperger Syndrome, pervasive developmental disorder-not otherwise specified (PDD-NOS), Rett syndrome, and childhood disintegrative disorder (CDD). Social relationships: Individuals with ASD may experience difficulties relating to others and forming friendships. They may have difficulties in areas such as understanding the feelings of others, understanding nonverbal communication, and interacting with others. These challenges can impede inclusion in work and community settings where individuals with ASD may have trouble interacting and forming relationships with coworkers and potential friends. Communication: In addition to difficulties in social skills, individuals with ASD may experience difficulties in communication. These difficulties may include the lack of ability to initiate or sustain a conversation, repeating words or phrases (echolalia), trouble understanding both verbal and nonverbal communication, and not using words to communicate at all. These challenges can inhibit interaction with, family member, friends, coworkers and others in community settings as these people may not understand the attempts to communicate made by the individual with ASD. Behavioral issues: Finally, individuals with ASD may exhibit certain behavioral characteristics such as insistence on sameness or predictability, repetitive or stereotypical motor movements, and highly specialized interests. Some individuals may develop behaviors that are highly challenging and limit inclusion in community settings. However, not all of these behaviors should be viewed as undesirable as many can be capitalized upon to create good matches between the individual and work or other community activities. Despite these common characteristics which define ASD, each person must be viewed individually in terms of his or her own strengths and support needs. 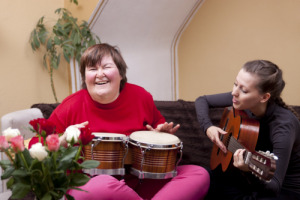 Furthermore, despite personal limitations and challenges, all individuals can be supported and provided with instruction that enables them to be fully included in their communities with careful planning and intervention. This manual merges best practices for community inclusion relevant for all individuals with developmental disabilities with specific support strategies that address the unique characteristics of adults with ASD. Under each of these funding sources, services can be provided for supported employment and community inclusion. As the names given to these services vary under each funding source, we explain how typical goals for each type of service map to the service names for each source of funding. Employment services include supports for preparing for employment, finding employment, and maintaining employment. A summary of typical goals for employment services and the service names for employment services under each funding source is provided in the table below. Community inclusion services are supports for persons to access and be integrated into community settings such as postsecondary education, volunteer activities, leisure and recreation activities, socialization activities, exercising civic rights and responsibilities, typical community services available to all people, and other activities of daily living. A summary of the goals for community inclusion services and the service definitions for community inclusion services under each funding source is provided in the table below. Under all these sources of funding, employment and community inclusion services cannot be provided at the same time (concurrently), but a person may be provided with a combination of each type (e.g., 25 hours supported employment and six hours community inclusion per week). There may be additional limitations on the number of hours a person can receive each service based on the type of waiver and other services he/she is receiving OR limitations on the length of time for which a particular service can be received. For all types of services, you should refer to the requirements for each waiver (see waiver service definitions and consult with supports coordinators for further guidance).